Sad but true, many business owners still look at trademarking as an expense, rather than an investment. — Do you think your business has a chance of staying afloat for at least 10 years? — Yes, that's the plan. We've been in business for a couple years already, so the hardest part is behind us, right? — Congratulations. So you say you've been in business for two years, do you think at least SOME of your customers buy from you because of your brand? — Probably... What do you mean? — I mean, do you think some of your customers FIND you because of your brand? Do you think some of your customers come back to buy from you because they REMEMBER your brand? 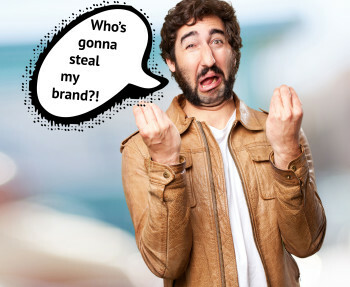 Do you think there's something in your brand that COMPELS some of your customers to buy from you? At least one of these three? — Well, let's be conservative. Do you think at least one out a hundred of your customers chose to do business with you and not with your competitors because of your brand? — Definitely. I'd say it's got to be more than 1 of 100. — It's OK. Let's stay conservative. — Let's say it will cost you $3,000 to trademark your brand. If your business makes more than an average of $30,000 a year for the next 10 years, even with only 1% of your customers buying from you because of the brand, your brand just paid for itself. — Simple math here. For the brand to pay for itself, it must generate $3,000 back in revenue from customers who buy from you because of the brand. Right? — It's 1% of your total client base. Which means your total revenue would have to be $3,000 times 100, or $300,000 over the course of 10 years, which is an average of $30,000 a year. — That's the thing. You're probably going to make a lot more than $30,000 a year—otherwise, why bother? And you're probably going to have more than 1 percent of customers buy from you because of the brand you're building. Do you see how trademarking is a good investment? — Do you see that a business that makes less than $30,000 a year is not really a viable business? Do you see that a business that has a brand that its customers don't care about does not have a valuable brand? — See now why I say that if it's not worth trademarking for $3,000, it's not worth trademarking for $3? To summarize—and let me put it bluntly—any business that transcended the hobby stage deserves to have a brand that works for the business. And any such brand deserves to be secured.